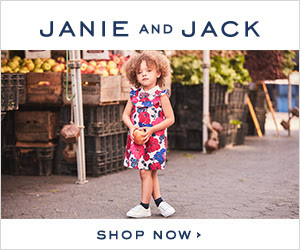 Home Money & Deals	Janie and Jack: Additional 20% Off Sale Styles, Plus Free Shipping! I managed to avoid Black Friday & Cyber Monday completely! Many others must have as well because my inbox is full of “Cyber Monday Extended!! !” even today. That was weeks ago, people! Then today I could. not. resist. one of my all-time weaknesses: Janie & Jack. Sale items, already at great prices, are 20% off today only PLUS get free shipping. Don’t forget to add your gift boxes as well, they are precious. My younger daughter lived in her first Janie & Jack outfit. She literally wore it whenever its as clean (and then some!). So precious. Since, they’ve delivered outfit after outfit that area a serious win for kiddo and mama alike. My older daughter even wore two Janie & Jack outfits at a national pageant she competed in. Don’t hesitate because things are selling out quickly and this sale is today only!